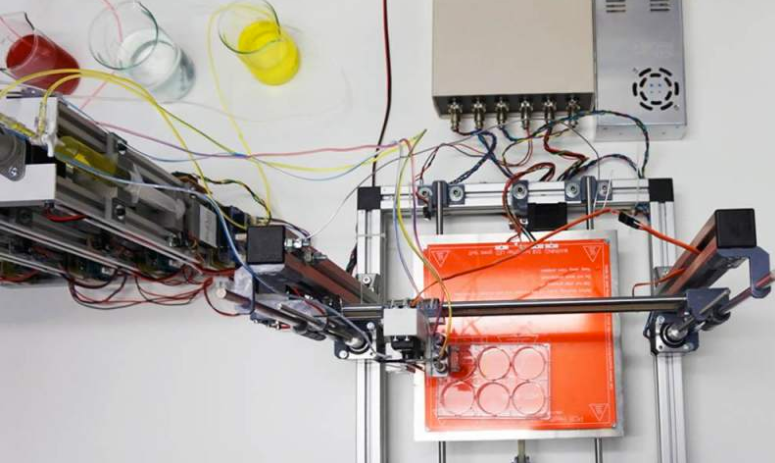 A prototype 3D bioprinter that can create totally functional human skin has been developed by scientists from Universidad Carlos III de Madrid (UC3M) and BioDan Group in Spain. The skin has been used to treat burns as well as traumatic and surgical wounds in a large number of patients in Spain, according to the scientists. The system provides two processes. Autologous skin (from the patient’s own cells to generate human collagen) for therapeutic use, such as in the treatment of severe burns, instead of the animal collagen used in other methods. The researchers have applied for approval by various European regulatory agencies to guarantee that the skin that is produced is adequate for use in transplants on burn patients and on those with other skin problems. The 3D-printed skin replicates human bilayered skin, using “bioinks” (biological components) containing human plasma as well as primary human fibroblasts and keratinocytes obtained from skin biopsies. These are controlled by a computer, which deposits them on a print bed in an orderly manner to then produce the skin. The researchers were able to generate 100 cm2 of printed skin in less than 35 minutes (including the 30 min required for fibrin gelation). Allogeneic skin (from a stock of cells), done on a large scale for industrial processes. This skin can be used to test pharmaceutical products, cosmetics, and consumer chemical products where current regulations require testing that does not use animals. “This method of bioprinting allows skin to be generated in a standardized, automated way, and the process is less expensive than manual production,” says Alfredo Brisac, CEO of BioDan Group, the Spanish bioengineering firm specializing in regenerative medicine that is collaborating on this research and commercializing this technology. The research was published online in the journal Biofabrication. Significant progress has been made over the past 25 years in the development of in vitro-engineered substitutes that mimic human skin, either to be used as grafts for the replacement of lost skin, or for the establishment of in vitro human skin models. In this sense, laboratory-grown skin substitutes containing dermal and epidermal components offer a promising approach to skin engineering. In particular, a human plasma-based bilayered skin generated by our group, has been applied successfully to treat burns as well as traumatic and surgical wounds in a large number of patients in Spain. There are some aspects requiring improvements in the production process of this skin; for example, the relatively long time (three weeks) needed to produce the surface required to cover an extensive burn or a large wound, and the necessity to automatize and standardize a process currently performed manually. 3D bioprinting has emerged as a flexible tool in regenerative medicine and it provides a platform to address these challenges. In the present study, we have used this technique to print a human bilayered skin using bioinks containing human plasma as well as primary human fibroblasts and keratinocytes that were obtained from skin biopsies. We were able to generate 100 cm2, a standard P100 tissue culture plate, of printed skin in less than 35 min (including the 30 min required for fibrin gelation). We have analysed the structure and function of the printed skin using histological and immunohistochemical methods, both in 3D in vitro cultures and after long-term transplantation to immunodeficient mice. In both cases, the generated skin was very similar to human skin and, furthermore, it was indistinguishable from bilayered dermo-epidermal equivalents, handmade in our laboratories. These results demonstrate that 3D bioprinting is a suitable technology to generate bioengineered skin for therapeutical and industrial applications in an automatized manner.